Boyds, Md. 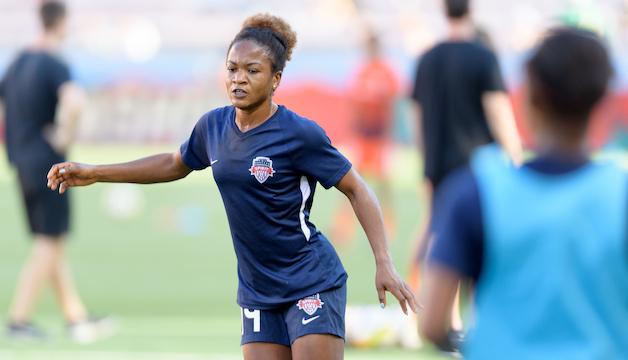 (November 22, 2018) – Washington Spirit forward Francisca Ordega received Woman of the Match honors for her performance on Wednesday in Nigeria’s 4-0 win over Zambia in the Africa Cup of Nations. Ordega netted a goal and assisted another as Nigeria picked up a critical three points in their second group match at the qualifying event for the 2019 FIFA Women’s World Cup. She assisted Desire Oparanozie on the opening goal fo the match in the 42nd minute, and followed up with a goal of her own in the 69th minute, finishing off a rebound in the box. After Nigeria lost their opening match to South Africa, Ordega entered Wednesday’s match on a mission to put Nigeria, the 10-time champion of the African tournament, back in the driver’s seat for World Cup qualification. The Super Falcons will aim to secure advancement to the semifinals when they conclude Group B play on Saturday, Nov. 24 against Equatorial Guinea. The top two finishers in each group will advance to the semifinals, and three of those teams – both teams that end up reaching the Final, and the winner of the 3rd Place Match – will end up securing trips to the 2019 World Cup in France.